If you are looking for effective methods to keep your indoor air safe for your family, our experts at Iceberg Mechanical strongly recommend installing HVAC UV lights. Take a look at how it does wonders in your home and the benefits that you can get from installing one. 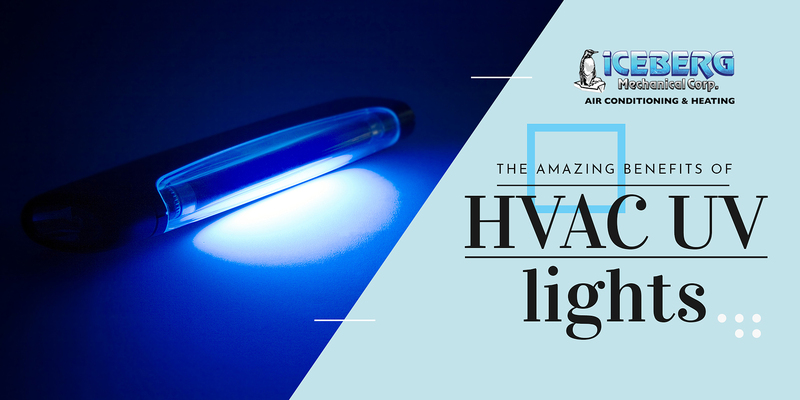 How HVAC UV Lights Work? Ultraviolet lights are designed to effectively kill microbes and other organic growths in the air, but they do not affect dust, dirt and pet dander. This is usually installed in the air handlers to kill microbes in the air that passes through. There are also residential cases where UV lights are installed near the coils to prevent the growth of mold and bacteria. And since the air passes through the coils, all other organic particles that flow with it are killed and eliminated. Killing bacteria and mold spores before they are circulated inside your home is a helpful remedy for allergies and respiratory illnesses. If you are living with sensitive allergy sufferers inside your home, this is a big help in giving them peaceful days and nights. Coil Sterilization. It is a stick type light which sterilizes the air handler coil. It is usually installed in the return air duct and runs 24/7 to keep the air clean and free from organic particles.it is the most commonly used UV light for HVAC units. Air Sterilization. This type of UV light sterilizes the moving air. It is also installed in the return air ducts and operates with the air handler. To ensure that your UV light will work best for your indoor atmosphere, we recommend you call professional help. Our experts at Iceberg Mechanical specialize in this task so you can count on us for proper installation. Just give us a call, and we will take it from there.